Nicki Gohorel's business inspiration started back in 2013 while living amongst a growing ex-pat community in Istanbul. 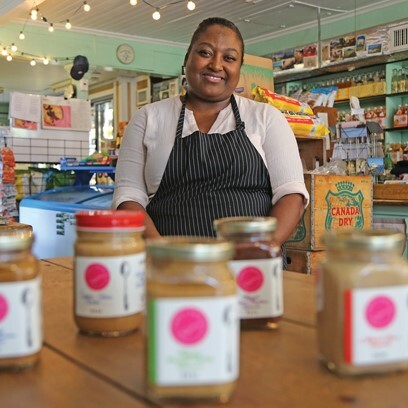 Their demands for a richer, more quality-conscious peanut butter lit the fire in her to create healthy and artistic varieties to fill this hungry niche and Simply Nicki was born. Nicki's mindfulness to source high quality ingredients then led her through a multi-cultural labyrinth and many travels - all of which she translated into her jars. She has tweaked the typical nut butter formula that relies upon heavy doses of salt and sugar for flavor by sourcing quality vanilla beans and exotic spices to add a tasty complexity to a household staple. As a flurry of orders filled her inbox, Nicki's name rapidly became synonymous with custom nut butters as well as delightful confections. Nicki was on her way to becoming the queen of custom nut butters - ready to satisfy palates as well as various dietary needs. In 2017, Nicki returned to her native North Fork of Long Island, NY, bringing back more than a suitcase-worth of passion, knowledge and a hunger to build on early success. Simply Nicki is dedicated to creating uniquely delicious food experiences that are hand crafted, ethically sourced, and contain either organic or all natural ingredients. None of Simply Nicki's products include things we wouldn't eat or put on our own breakfast, lunch or snack table such as: GMOs, pesticides, preservatives, processed ingredients, stabilizers, and saturated fats such as palm oil, fruit oil, hydrogenated or partially hydrogenated oils. Even our sweeteners are healthfully curated! Simply Nicki Nut Butters limit their base ingredients to organic nuts, coconut oil (kills it in the creamy texture dept. ), and a hint of sea salt. With the exception of our butters that contain honey or white chocolate – all of our butters are vegan.